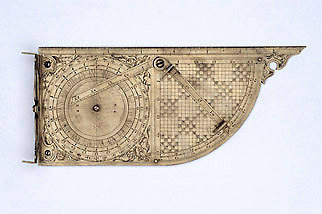 This surveying instrument brings together a number of functions in a neat design. Horizontal angles can be measured using the compass and the pivoted alidade at one side means that bearings of elevated or depressed positions can be taken. Bearings can also be measured by the alidade on the quadrant, using the compass for orientation. The grid within the quadrant is used for calculations involving right-angled triangles, while on the reverse is a set of linear scales with the standards of different cities. There is no sign of any means of fixing the instrument to a stand and it was probably meant for use on a plane table, at least when taking sights. The long edge, with a scale of inches, could be used in conjunction with the alidade on the quadrant. This alidade has a stud for stopping it when it is parallel to the edge, while the other one is pierced to allow a clear view of the sights in that position.